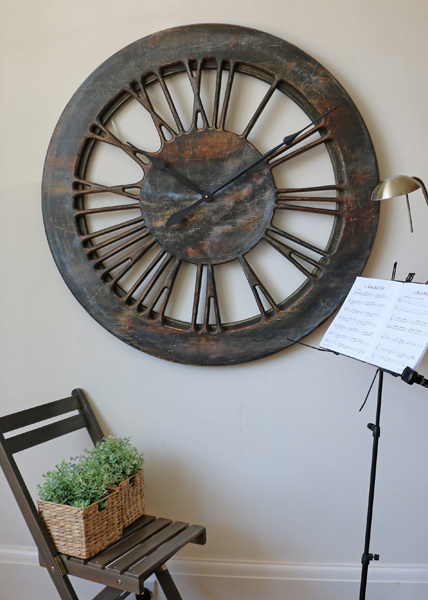 40" Large Contemporary Clock. Handmade from wood and hand painted. 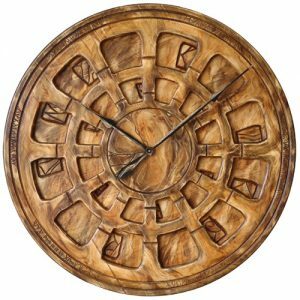 The “Old Shaman” contemporary clock is handmade from two large panels of pine wood. Its is beautifully hand painted to add uniqueness and character. 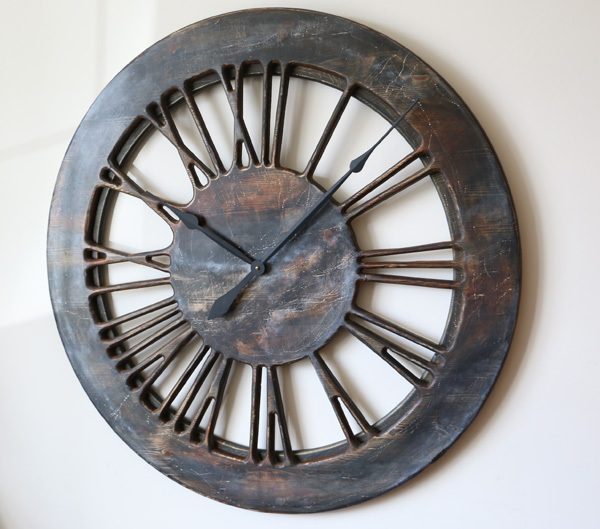 The most stunning clock face is displaying carefully hand crafted Roman Numerals on a wooden frame and you can see the wall between the numbers. 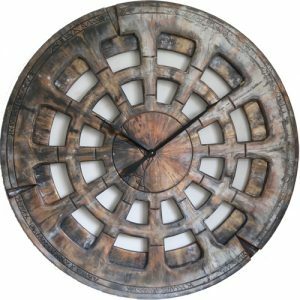 With a total diameter of 75-120 cm and its unique contemporary design, the “Old Shaman” will look fantastic in all interiors. 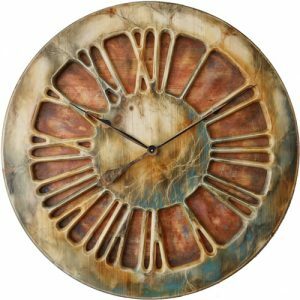 The “Old Shaman” is probably the most stunning large contemporary clock you have ever come across. Normally you would expect to see that kind of product in a prestigious Art Gallery or Luxurious Hotel. 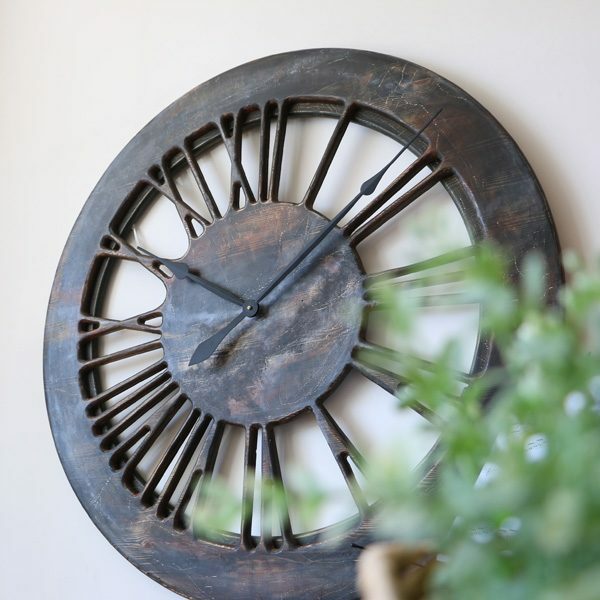 The face of this breathtaking timepiece is cut from a single panel of pine wood and displays large Roman Numerals with transparent background. If you look close enough you will notice a narrow circular rim that we attached at the back. This provides three dimensional nature and astonishing strong appearance. Can you just imagine sitting around the table and entertaining your guests by telling them about Peak Art’s Skeleton Wall Clocks. Although you can see many different pictures here, we have also recorded this short video to provide some extra information that you may be keen to know. 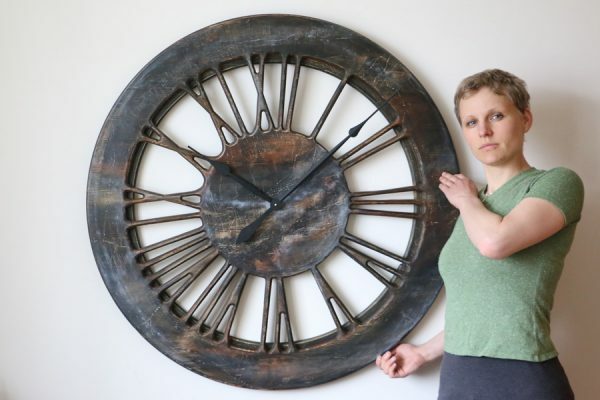 The clock on the video is 100 cm (40″) diameter but we can also make the same design in two different sizes. Simply select the required clock diameter from the drop down list. The mechanism is the most powerful Quartz sweep movement and you need a single C Cell battery. 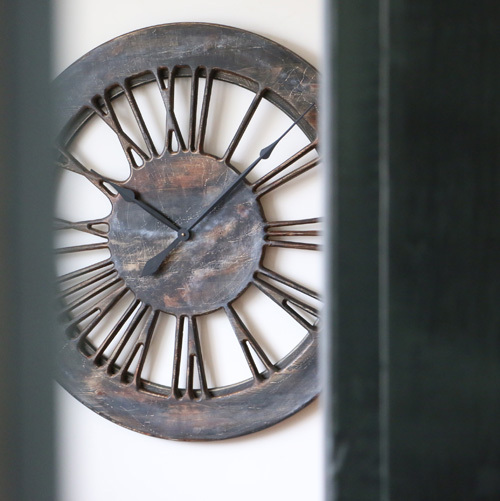 When we send you the clock we first detach both hands to prevent any damage in transit. We have included full instructions explaining how you need to attach both hands and set the time in this video. 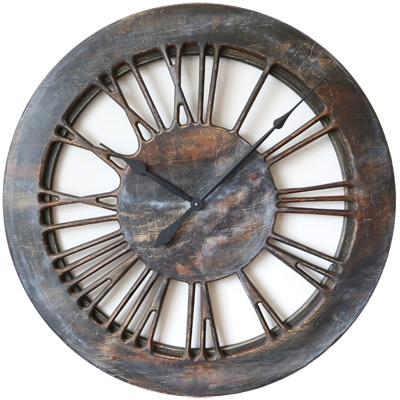 How about large contemporary clock from Peak Art online store? 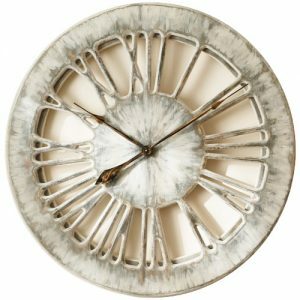 The Peak Art contemporary clocks are rare pieces of art. That is why they will come to your mind when you start revamping your interiors or building the new extension. 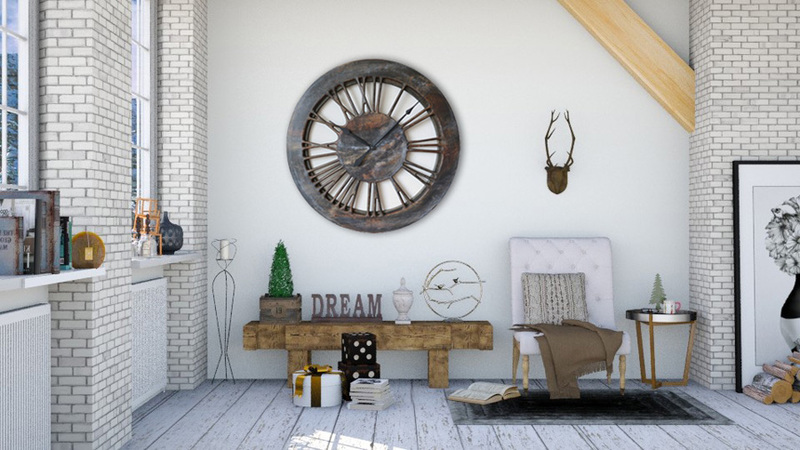 Do you need to fill large empty wall space or add some exceptional character to your living room? 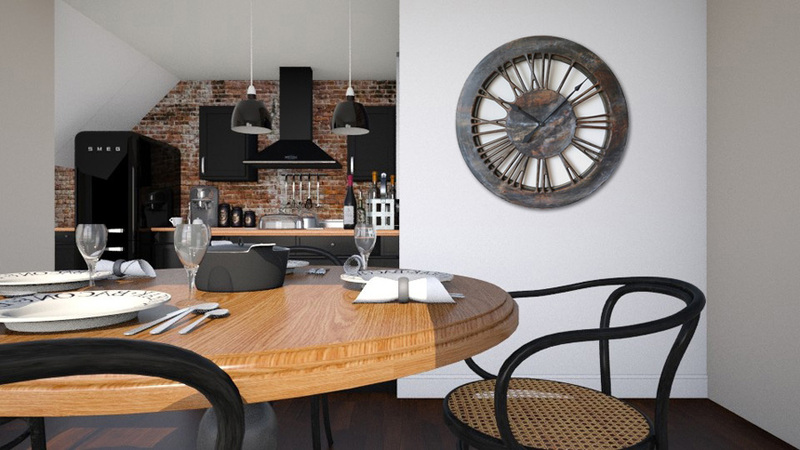 If that is the case, with Peak Art clocks you won’t be disappointed. You can mount them in any room in your house but make sure to keep them away from heat or moisture sources. The clocks with that much charisma will suit well in your lavish office, stylish restaurant or posh penthouse apartment. 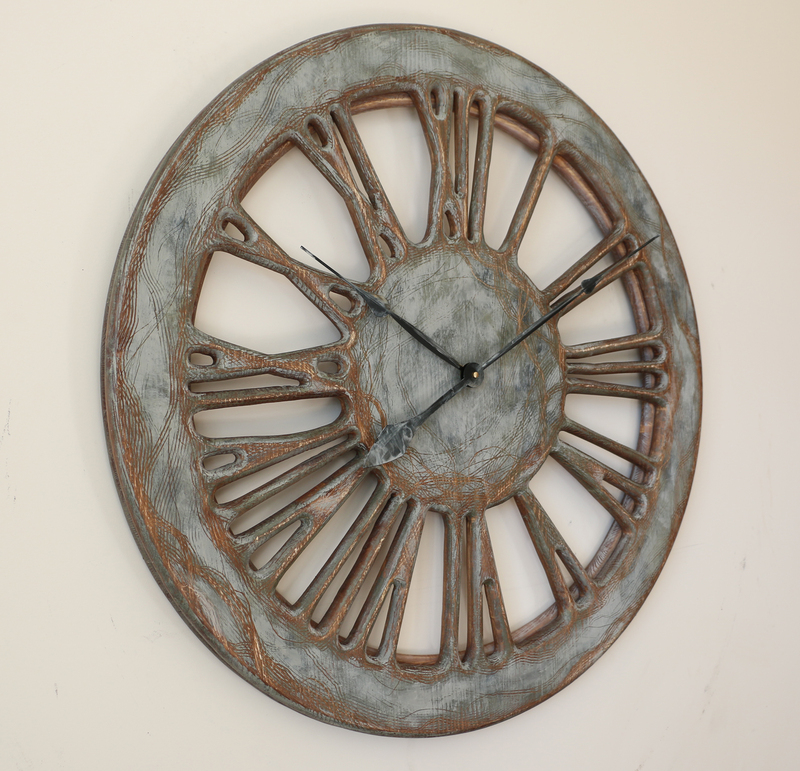 Search for large handmade wall clocks on google and see yourself that Peak Art is owning this niche market. That is because nobody else comes even close to the quality and uniqueness of our products. Check Peak Art Facebook Page and join thousands of followers across the Globe that have already appreciated our brand.